Randolph Ashton is using human embryonic stem cells to grow neural tubes, which give rise to the brain and spinal cord. He hopes to better understand what goes wrong in conditions such as Parkinson’s disease and amyotrophic lateral sclerosis, or Lou Gehrig’s disease. Ashton’s three-dimensional neural tubes in a dish could also be used to screen chemicals and environmental toxins to see if they kill brain cells or alter cells in ways that cause birth defects. “It could be a useful model to screen for chemicals that disrupt the development process,” said Ashton, an assistant professor of biomedical engineering at UW-Madison. At the university, Ashton is one about 100 faculty researchers — and among roughly 500 scientists overall — who are using stem cells for drug or chemical screening, disease modeling or developing cell therapies for disease, according to Dr. Tim Kamp, director of the university’s Stem Cell and Regenerative Medicine Center. Some study human embryonic stem cells, which campus scientist James Thomson first announced the ability to grow in the lab 20 years ago this month. Others rely on induced pluripotent stem cells — skin or blood cells reprogrammed to their embryonic state — which Thomson and Japanese researcher Shinya Yamanaka developed in 2007. Ashton was drawn to stem cells because of Thomson’s pioneering role in the field. In 2001, when Ashton was in college studying chemical engineering, Time magazine featured Thomson on the cover. Krishanu Saha, also an assistant professor of biomedical engineering, uses stem cells to test the effectiveness of another new biological tool: CRISPR, a form of gene editing. CRISPR, which stands for clustered interspaced short palindromic repeats, is a “molecular scissor” that allows genes to be edited precisely, potentially as a therapy. Discovered in 2012, the technique is based on a defense mechanism in bacteria. Saha has packaged CRISPR editing machinery into a nanoparticle that could be injected into patients to repair disease genes. He is working with Dr. David Gamm to develop a gene editing therapy for macular degeneration, among other potential clinical uses. Gene editing can cause unintended changes in the genome, which could lead to immune reactions or even cancer. To test the accuracy of the editing process, Saha uses stem cells, taking advantage of their ability to grow indefinitely in a dish. “You can systematically test the genome editors over months or years with the same cell lines,” he said. 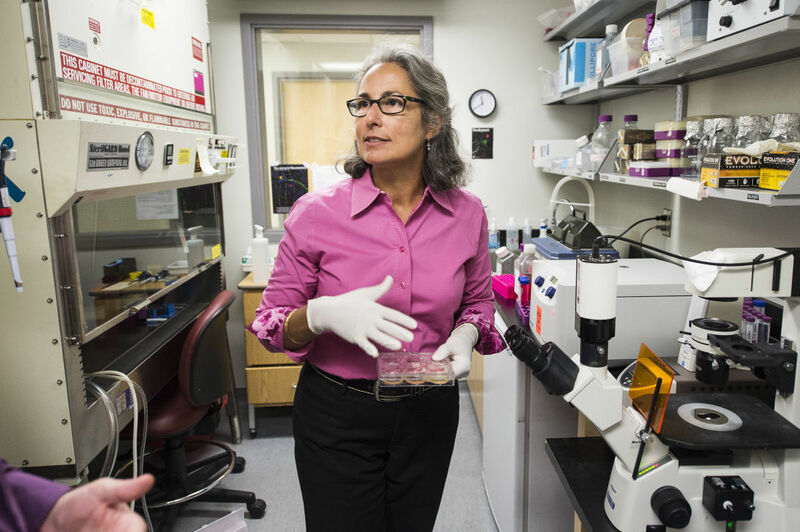 Another condition Saha’s strategy could benefit is Fragile X syndrome, a developmental disorder that is a focus of Anita Bhattacharyya’s research. Bhattacharyya, an assistant professor of biology at UW-Madison’s Waisman Center, is studying iPS cells from Fragile X patients and embryonic stem cells edited through CRISPR, with Saha’s help, to carry the gene mutation that causes the condition. In people with the disorder, the gene is turned off. “We’re looking for ways to turn the gene back on, which maybe could relieve some of the symptoms,” Bhattacharyya said. She is also studying iPS cells from people with Down syndrome, to understand why they have a shortage of nerve cells and tend to develop Alzheimer’s disease, apparently from what is known as oxidative stress on their cells. The hope isn’t for a cure, but for a treatment that might help patients live more independently. “We can use our iPS-cell-derived neurons to ask, if we can correct the oxidative stress, does that lead to better function?” she said.